Adrien Friggieri’s interactive diagram Agreement groups in the United States Senate also uses co-voting data from GovTrack and a new self-authored clustering algorithm. I have to admit that I haven’t read the clustering paper they reference and so don’t fully understand the diagram. Why does Jesse Helms’s line bifurcate in the 106th Congress? I also have trouble finding similar clusters and movements between clusters when comparing these two diagrams which cover very similar datasets. Khairi Reda (et. 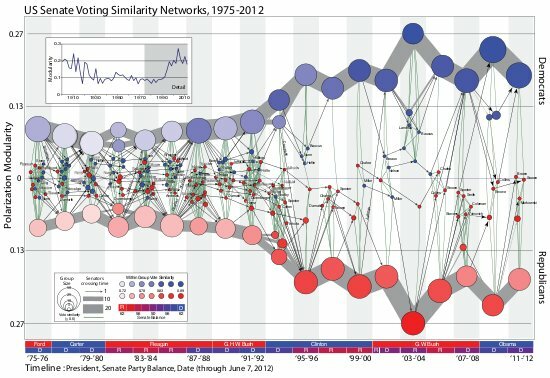 al)’s 2011 paper Visualizing the Evolution of Community Structures in Dynamic Social Networks also looks at U.S. Congress (as well as zebra social networks), but uses co-voting networks in the House of Representatives. It appears that the clustering was done in the co-voting network (counting Yes, No and Not Voting as seperate types of ties, which I think is an unusual representation?) to partition the House into communities (arranged as the alternating gray and white bands) and then individual’s trajectories are plotted as the colored threads. But it sounds like each band doesn’t always represent the same community, otherwise, how would the lines move between the communities? … the layout algorithm calculates a vertical position for each community, as well as vertical offsets for the threads of individuals within communities. The ordering of communities is based on an influence factor, which we define as the cumulative number of individuals affiliated with the community over all timesteps (individuals may appear more than once in this count). The communities are then assigned to rows. A single row can contain multiple communities as long as they do not overlap in time. We loop through all communities in decreasing order of influence and assign each community to the first available row, taking care to not overlap with existing communities. Interestingly, they also cite the xkcd movie narrative image below as partial inspiration for their approach. He does the off-time-axis positioning using the elegant/crude measure of number of seats held by each party. Which I guess means this isn’t technically a network digram at all, its more of series of stacked bar charts, a “stream graph”. 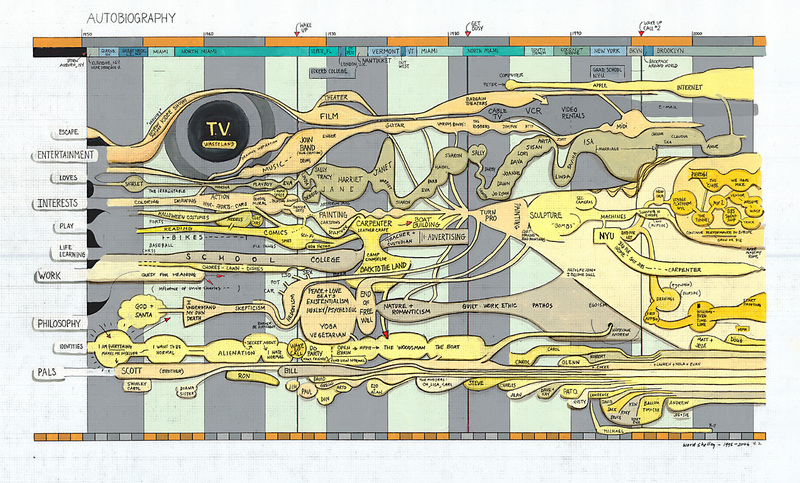 The annotations and relatively few highlighted trajectories of individual persons make the chart very readable. 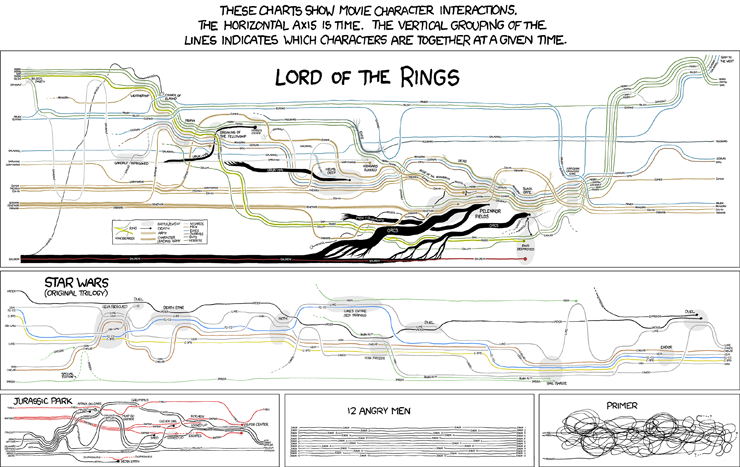 The xkcd movie narrative charts are wonderfully clear and amusing illustrations of the concept. Each character traces out a line horizontally (well, usually) in time, while the vertical grouping of the lines indicates which characters are together at a given time. Reminds me of work by the artist Ward Shelly who creates artistically positioned highly detailed timeline diagram paintings like his Autobiography. 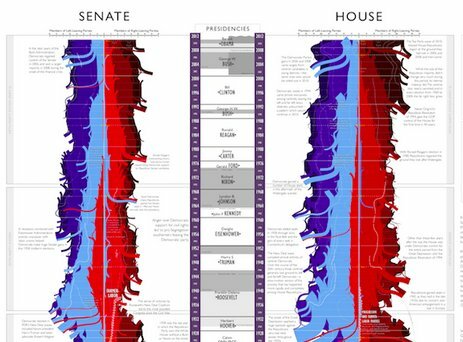 Like the the narrative charts, the off-time axis positions seem well organized but at the same time fairly arbitrary, arranged for visual clarity and sometimes dramatic effect. It seems like it would be quite challenging to write an algorithm capable of doing this type of layout optimization, but clearly people have done it. 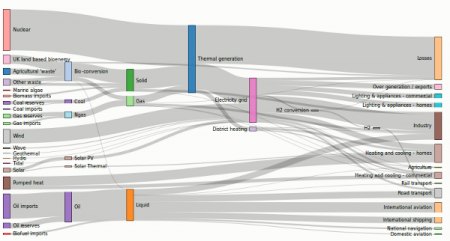 One of them is Mike Bostok’s d3 infoviz toolket Sankey example (he credits http://tamc.github.io/Sankey/ for original code). I’m considering trying to generate something like this in R, so I’d love to see other good examples.